Malanga is a tropical vegetable also known as eddoe. This food is rich in carbohydrates and has an unpleasant taste when raw, so it is always served cooked. Malanga, as with many other vegetables, is not a significant source of fat or protein, but unlike many vegetables, it is rich in calories. This may make it preferable for athletes or others with high calorie demands. One cup of the cooked malanga provides 132 calories, which is about 7 percent of your total calories, based on a 2,000-calorie diet. While this may not seem high, comparatively, a cup of cooked broccoli contains just 44 calories. Thus, malanga may not be your best vegetable option for weight loss diets. Malanga is low in fat, so it can be suitable for low-fat diets if you can fit it into your calorie needs. Each cup of cooked malanga contains just 1 g of fat. None of this fat comes from saturated or trans fats, which are types of fat that can increase your risk of heart disease. Because of this risk, the American Heart Association recommends limiting trans fat to less than 1 percent of your calories and saturated fat to less than 7 percent. The bulk of the calories in malanga come from the carbohydrate content of this vegetable. Each cup of cooked malanga provides 32 g of carbohydrates, which is twice as much as a slice of bread. Carbohydrates provide your body with energy, so you may find high-carbohydrate foods such as malanga suitable for fueling athletic endeavors. 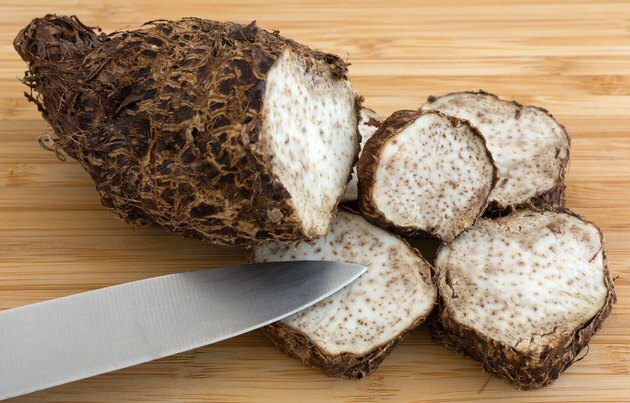 Malanga is not a rich source of fiber, as each cup of cooked malanga provides just 2 g. Fiber is a vital nutrient that enhances feelings of fullness, ensures healthy digestion and can help keep your blood sugar levels stable. Malanga is not a good source of protein. Each cup of cooked malanga offers just 2 g of protein, or 1/4 of what a cup of milk provides. You need to consume protein to support the synthesis and repair of your body's tissues, such as skin and muscle.